Don't be put off by the fact that the ramshackle horseshoe bar is always full, or that the vast but rowdy main room has the atmosphere of a sixth-form common room crossed with a 1970s pool hall. 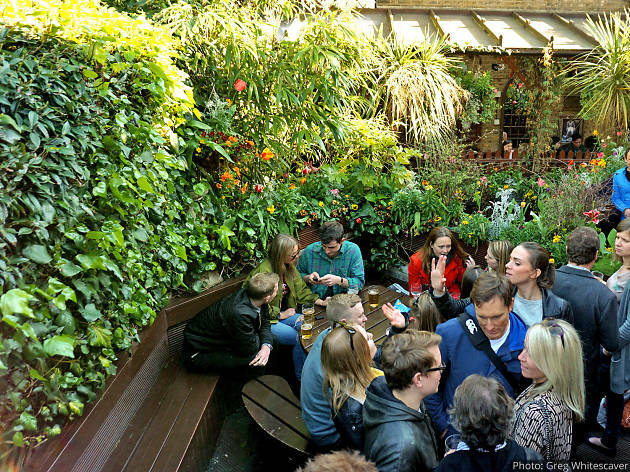 This vaguely Irish pub has long been a Finsbury Park favourite, and that's 98 percent down to its amazing garden. Drinks are reasonably priced, the Thai food is good and it’s a sport-watchers paradise, but these are just cherries on the verdant layer cake that is its three storeys of leafy nooks, crannies and look-out posts outside. Even when it's chilly you'll find a comfortable outdoor spot as many of the benches are heated and covered. Just be warned that even Ray Mears wouldn't be able to direct you to his table, so get friends to let off a flare (or carry a helium balloon) if you're the last to arrive. Great little pub, tucked away in the residential streets of Finsbury Park. It's got that proper 'local' feeling, with standard regulars propping up the bar, but coupled with the yuppies that are rapidly invading the area. Thai food is really blooming good (starters not so much), pad Thai is super tasty, incredibly flavoursome and great value. Nestled in the entrails of Finsbury Park stands this glorious pub! 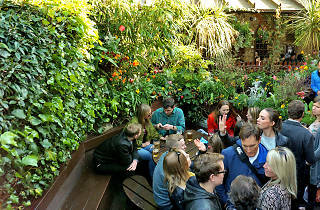 Perfect for Summer or Autumn drinking with,in my opinion,the best beer garden in London,bar none! The pub has this wonderful,in my description,Escher like garden.With staircases draped in flowers leading all different nooks in the garden,it is a maze to explore whilst you are up there! Serving good ales and wines and Thai Food. Now....I have to say..... when I went and it was very busy.......my mate went a cued to order food and was waiting for 45 mins before she could even get to place her order THEN was stuck a further 20 mins at the bar trying to order drinks. Although I had a lovely time chatting with other punters in the pub,I really missed my friend for that hour,I really did! So,be wiley when you go,order food first me thinks and maybe wrestle people to the bar??! That being said I love it at this pub and will go again and again,especially when the sun is out- tis no better place to crush a cup of wine or wax lyrical with chums of a Sunday afternoon. best time to go is summer when you can make use of the roof terrace, but get there early as everyone who knows about this place knows to head there! really great for rugby too - fantastic atmosphere, can't beat it. but again, get there early, it's very very popular with locals and those in the know. they only serve thai food, which can be a pain for some, but allow a local pizza place to deliver there and its very good pizza - not the usual greasy take-out! Hidden away just off Stroud Green Road, this pub is a must-visit. A stunning outdoor treehouse-style pub garden makes the Faltering Fullback a perfect venue for the summer months. Plus, outdoor heaters mean it's a cosy autumnal hangout too. The indoor sports area is not really my style, but it always looks very busy and popular. Let's not kid ourselves, it's all about the outdoor space with this pub and luckily for them, it's fantastic. It's like Ground Force have run wild, which essentially equates to a split-level decking, tree-lined outdoor drinking paradise. The inside has a massive venue for watching sports that tends to be very busy for big events and the bar at the front is small which doesn't give any hint of what lays behind it. This is my first choice pub near the Arsenal ground to watch home &away matches (also Irish sport). Well run, friendly, good choice of beers, tasty Thai food at reasonable prices, wonderful garden - what's not to like? Only downside is you can't book tables so you have to take potluck at busy times. If I was to write a list of essential pubs to visit this would defiantly be on my list, every year when the sun starts to appear in London I always think "Must be Faltering Fullback time soon"
The outdoor area is one of the best in London in terms of layout and decor, and there are lots of nice areas to sit indoors as well. My main advice is to plan your visit, it can be a slight nightmare to navigate when busy so make sure if you are going in a big group, secure your plot early! Amasing pub. Prettiest beer garden in Lon I think. THAI FOOD AND GREAT PUB GARDEN! The garden is worth the visit. Loved it, but so does everyone else which means loitering malignantly trying to awkward out the people sat down on the terraces into giving you their seat is a reality every time you come to this marvellous pub in Finsbury Park. The beer is great, the staff are lively and knowledgable and the tiny little Vietnamese restaurant snuggled into the back serves the most delicious peanut-packed pad thais! The pub quiz is also hilarious. Would recommend a visit at least once a day! Heart and soul of Finsbury Park! Lovely pub with a great outdoor space, good vibe and glorious drinks options. Gets really busy on the weekend so sometime you struggle to find a seat (especially outside), but totally worth it. Also sometimes take a while to get your bevs as its so busy, but it does have quite a good party vibe. Definitely the best place for a drink in Finsbury Park. The fullback is a very surprising pub hidden in Finsbury park area. First thing to notice is the funny ceilings in the front room with lots of objects hanging around. Then you have two really cosy rooms with little wooden benches or comfy armchair to read a good book. Ok it's a bit smelly, the drinks aren't that great, there's often a long queue for the bar - but at the same time this has to be my favourite pub in London. There's a narnia/secret garden feel to it, with a flower and ivy covered beer garden on twisting levels and the rooms inside wrapped around the main bar with violins and bicycles hanging down from the ceiling. There's always and intimite feel and a friendly crowd, and the Thai food is excellent (much better than the actual Thai restaurant in Finsbury Park - Cats). Highly recommend going on a warm summer's evening with a big group of friends. Their pub quiz nights are super fun and their Thai food is also REALLY tasty. I'm really looking forward to go there on a sunny day, I miss those vibes. Lovely place and atmosphere. A great pub, with reasonably priced drink and an amazing outdoor space. Many leveled, wooden benches, plants and flowers galore and lots of private seating so you never feel overlooked. This is such a fab location for a pint after work in the sun or to relax all day on a Sunday. They also have a Thai restaurant and the food smells good! Great for sports fans, they also do a weekly pub quiz. The roof terrace is amazing, a warren of hidden tables and greenery. Somehow we always seem to find a table even though it's usually heaving with people. The only drag is having to go down to the bar to get a round in and negotiate the winding steps carrying a tray of pints. I've never spilt one yet though!